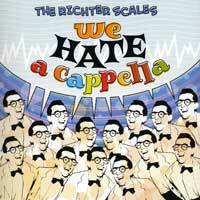 The Scales are an all male, 18-strong Bay Area ensemble which first started singing a cappella together in 2000, and, according to their website, "We Hate A Cappella" is their debut CD. 12 manic, high-energy cuts, some favorites are Lennon/McCartney's "Can't Buy Me Love," "I Got Mail," the very funny original by group member Brian Rosen, (who also sings lead), "High Notes." "Stockholm Syndrome" (which focuses on love as a hostage situation), and "Pencil Boy" (where our hero and Crayon Girl are "drawn together") also Rosen originals, strong covers of Steely Dan's "Reelin' In The Years," the Doo-Wop standard "I Only Have Eyes For You" and the Disco hit "Love Machine;" and finally the oddly compelling, fairly silly title tune, also a Rosen original. "We Hate" is a strong, funny debut recording with an attitude by 18 very creative, talented guys - give it a listen!